"He's black, you're black, you speak the same language and you fight each other like animals"
Zimbabwe, 1984. Corruption is rife, black people are fighting black people, socialism is being replaced by rampant, vicious capitalism. Nobody is being brave. Three men represent society in microcosm. Two workers one black and one white, and sworn enemies, are employed in the tool making workshop of an apparently socialist MP. But is it the MP, mouthing socialism while practicing the most oppressive capitalism, who is actually Zimbabwe’s real enemy? One of the most talked about shows from Zimbabwe, WORKSHOP NEGATIVE is an uplifting and comic response to the backlash of Zimbabwean independence. As relevant today as it was 30 years ago, it pulls no punches in airing the issues that everyone was talking about at the time, but were too afraid to raise. 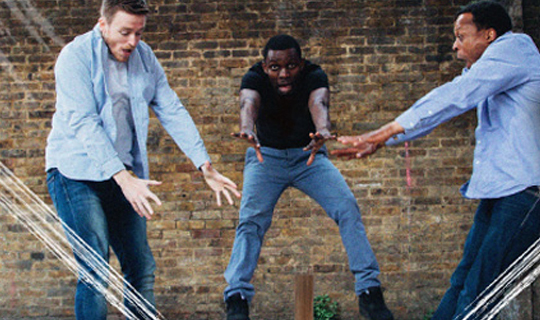 WORKSHOP NEGATIVE is a UK Premiere and a brand new production from Tangle, South West England’s African Caribbean theatre company.